Parsimonious and identifiable driver models for online identification and interface adaptation. Measuring and modeling how humans use preview information of a trajectory to follow for anticipation or feedforward control. Quantitative data-driven perception modeling that separates effects of different types of cueing errors in different axes. Identifying and modeling how humans use visual and physical motion feedback for control. Data-driven and assumption-free selection of the optimal human control model structure and response dynamics. Determining motion perception thresholds from active control task data using multi-channel human control modeling. Proving enhanced training effectiveness by going beyond realism in training simulators. 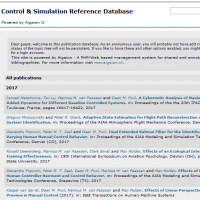 Improving the match between helicopter flight dynamics and simulator cueing. A cybernetic analysis of the limitations on human control adaptation due to changes in controlled dynamics. Improved measurements of simulation motion states by combining data from multiple sensors.